So the supposedly affable boffins at The MET Office really need to go to Specsavers. They have repeatedly told us that it is not the case that on many, if not most, days our sky is filled with matter ejected from aircraft. Leaving aside the fact that this stuff is sprayed deliberately, even if it were incidental pollution, it is there. It is visible. It is real. They deny it but the camera does not lie. We have recorded a brief message for The MET Office weather desk staff who claim this is impossible. Just so as to confirm the nationwide state of the sky we see the NASA Worldview image below, which clearly shows a layer of spread out trails from aircraft covering pretty much the entire country. Not a single natural cloud in sight. We rest our case. Persistent trailing is the most obvious form of Climate Engineering and images such as the 2 below are hard for even the most hardened sceptic to ignore. They don’t notice them when going about their daily business, but oddly when seeing them displayed like this they do notice the unusual patterns. Despite this, most people will still not take them seriously though, and we often see a process of cognitive dissonance and deep and determined denial kicking in, whereby the viewer will try very hard to think of an explanation to anything they see, however bad, shocking or unusual, and repeat things he or she has heard ‘on the telly‘. 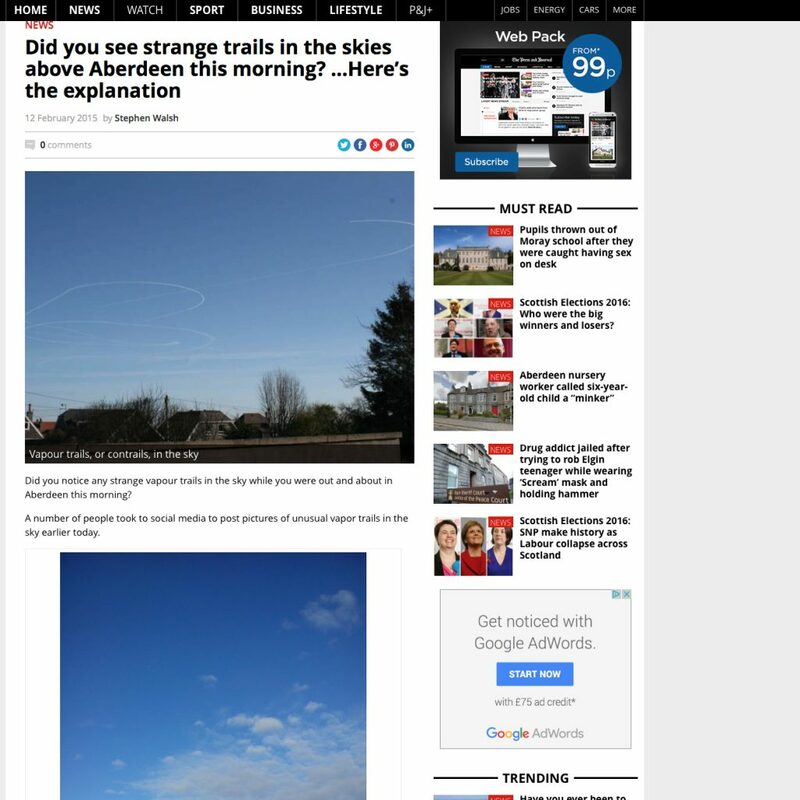 Its just vapour trails… etc. They don’t tend to think about the fact that it is blocking our sunshine on most days and so, even if it were natural (which of course it isn’t) it should not be happening. This process is a subconscious attempt by the viewer to avoid having uncomfortable feelings (cognitive dissonance). By admitting to the fact that what they are looking at is very bad, they are putting themselves in a difficult position where they have to accept something very big and very bad is happening. That’s just too inconvenient for most people so denial is the preferred option. We can understand ordinary folk not being able, or willing, to recognise that an entire sky is littered with trails that are not natural, but more recently the MET Office have claimed that this is not possible, that a sky cannot be completely covered by contrails or other matter ejected by aircraft, so we decided to make a point and prove them wrong (once again). Below we have the best example of a series of time-lapse films from London over the first few days in May (2016) – 3rd to 6th. It is an unusual time because there was not a single Induced Cumulus in the sky for more than 2 days. 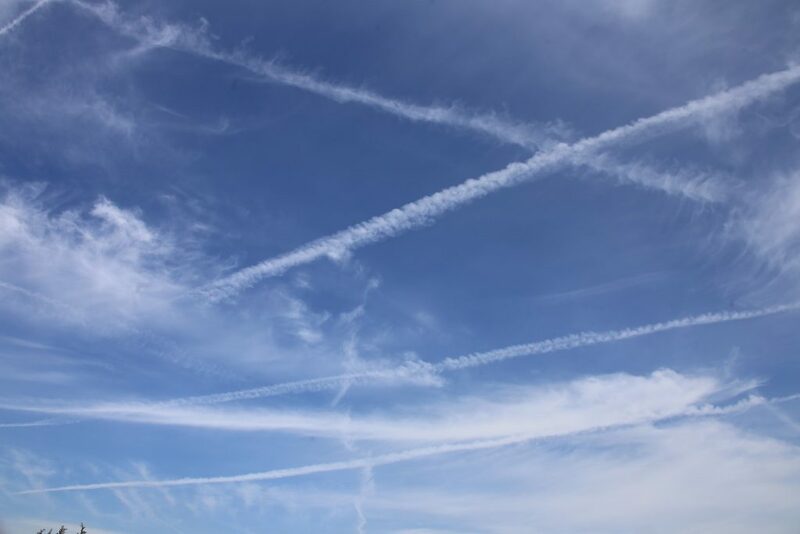 This is very unusual because the more recent trend of the Climate Engineering world is to allow the induced Cumulus to form until such time as enough cover has been produced to mask the persistent trails. Allow the Cumulus to build, then start to spray over it. The most obvious and shocking of the films of May 6th, but important clues can be seen in May 3rd also, as the Induced Cumulus clears to reveal the mess that has been unfolding above it. We see just a hint of Induced Cumulus on 4th May, and nothing on 5th or 6th. Just a lot of very obvious persistent, spreading trails. See the set of 4 time lapse films here. 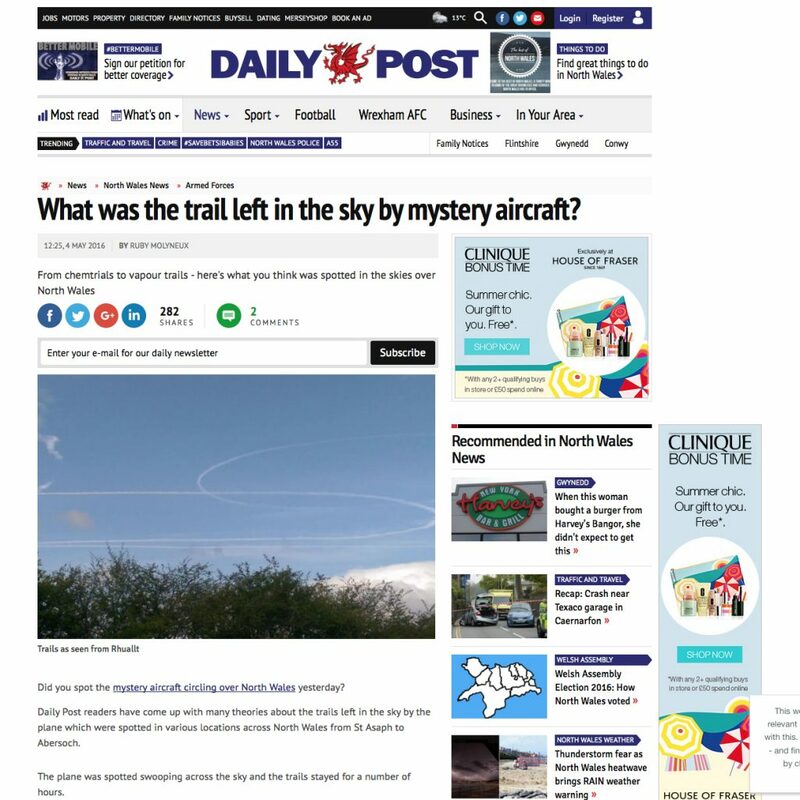 Luckily, long gone are the days when they could do this willy-nilly without the public causing a stir, and indeed several reports of strange vapour trails appeared in local and even national media. Some were quickly explained away by official sources as military activity, but are we really to believe that the military were conducting strange atmospheric experiments all over the UK on that day. Mainstream media even tried to insinuate UFOs and other such nonsense to try to ridicule the situation – denigration by association we call it – but ultimately many thousands of people saw our skies being filled with lines from aircraft and the sky completely blocked with a white blanket of haze. Whichever way you look at it, that’s just not good and not acceptable ! Why were they so obvious? These persistent trails were only so clearly visible because, as we suggested earlier, the Induced Cumulus were not present at all. 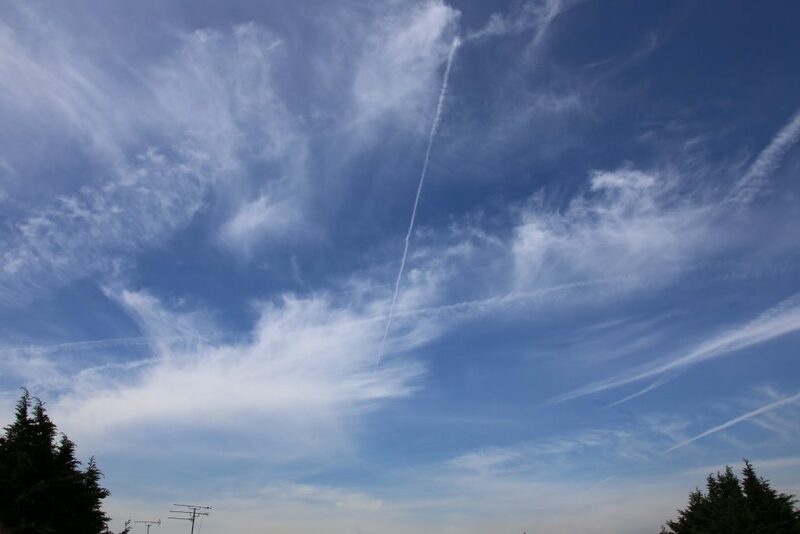 People often interpret these events as unusual – heavy spraying – but the reality is this is what is going on above the Induced Cumulus on most days and we have countless images that show this level of spraying visible through gaps in the Induced Cumulus clouds on any given day. There is nothing unusual about it at all other than the fact we could see clearly and it in all its glory. Of course sceptics and the The MET Office will claim that weather conditions were not conducive to the formation of Induced Cumulus, but a casual look at weather records for those days shows nothing out of the ordinary, and nothing that has not been repeated, before or since, so something else is at play. We suspect that whatever the secret ingredient is that promotes the formation of those fuzzy little cumulus clouds that only form over land, was not operational or present on those days. We delve into this more in another article here. One would imagine that if the organisations behind the current CE programs would simply not spray on those days for fear of being noticed, but the problem with that is that if they dont, we would see the big and beautiful blue skies and fresh air that we used to get before they started doing this, so the program(s) must be maintained so as to keep the sky nice and hazy and white. Can’t have those pesky commoners seeing a really deep blue sky now can we. As always keep ’em peeled, and please get yourselves a Brinno TLC Pro time lapse camera and do this yourselves. There is a limit to how many times people can say its probably just this or that, before they will have to start to confront the bitter reality. If you can show them footage of our sunshine being blocked every day the penny might just drop eventually, however hard that may be for them.